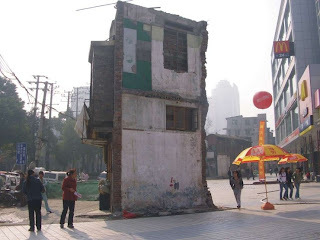 his dilapidated shop/home sits continues to do business outside a sparkling, relatively modern-looking shopping centre in changsha city and the contrast between the two buildings is shocking. i don't know much about this house but if you look at the first photo, there are a couple more old properties which also seem to have weathered the development storm. the photos themselves are from october 2007 so i'm unsure whether they held up for much longer and a search on google maps proved fruitless.